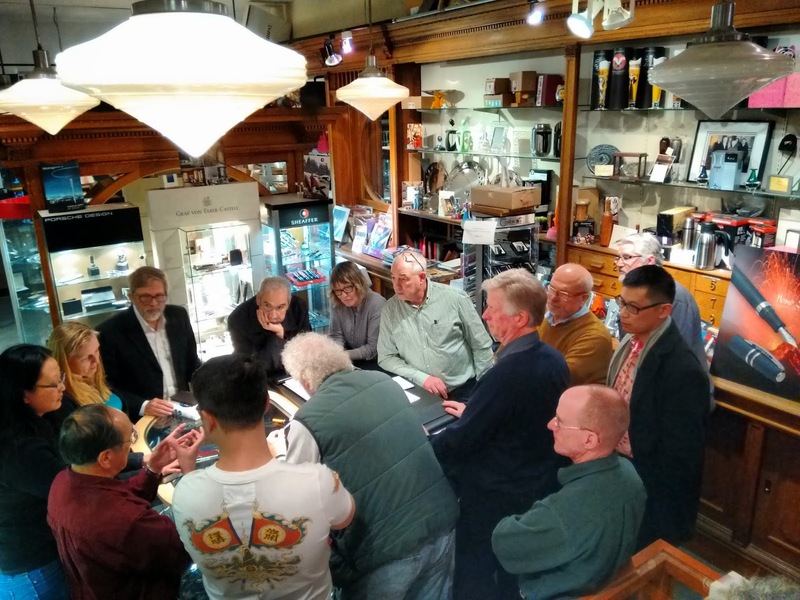 Many thanks to Richard, our pen club host at Perks pen store, for snapping some photos during our February meeting. 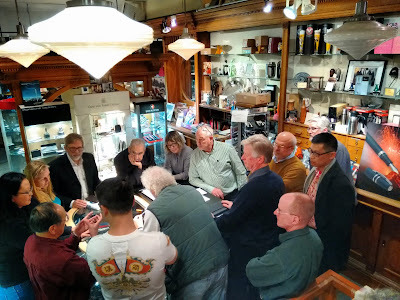 I was attending the big pen show in Los Angeles (I'll post a report about it, here on our blog, later this week) and couldn't make it to our meeting, so I was glad that he took a few photos to document the event. Grateful thanks also to longtime VPCer Bruce Reeves for leading the meeting in my absence. We had several new members in attendance---Catherine S, Michael Q, and Richard D. Also in attendance were two guests---author Ted Bishop (his website) who was in town to read from his newest work The Social Life of Ink, and Evy van Nobelen, veterinarian and artist-in-ink from Whitehorse (her blog). Nice to see that Leo C. from Edmonton was able to attend another meeting of ours. 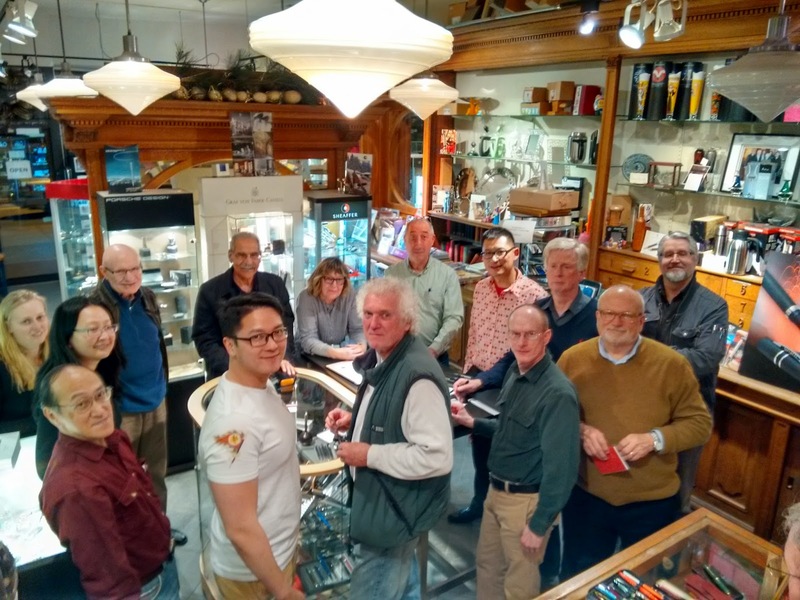 Thank you to all members (new & old) and visitors for coming! 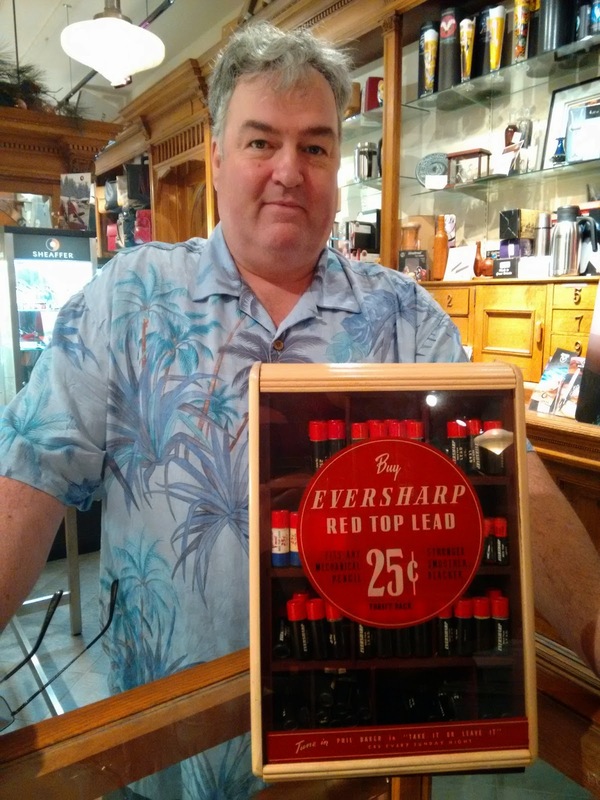 Our February meeting topic was "Vacation Pens" and of the examples brought in for this topic, Bruce writes "...there were many differing views on what to bring on vacation – ranging from pencils to near-disposable fountain pens to top-of-the-line Italian celluloid." Before I left for L.A, I wrote and told Bruce my three "Vacation Pen" choices--a Lamy Safari fountain pen (they're durable--made of ABS plastic---and light), my Sailor Sapporo fountain pen (it's small in the pocket, but a decent size when posted; also has a gold nib), and my new Levenger True Writer ballpoint in the "Bouquet" pattern (because you need a ballpoint in order to write on postcards---a fountain pen just won't cut it! ). As for ink, I'd take my Noodler's #41 Brown--a great shade of brown that is also waterproof. Quick reminder: our next meeting will be held at the same place (Perks pen store, 5844 Cambie Street) & time (6:30pm-8:30pm) on Thursday March 19th and the topic will be "Green Fountain Pens". Great theme idea, we may have to borrow this one for the London Pen Club. Love Ted Bishop's ink stained shirt too.